Wakaan continues to warp time and space itself as Space Jesus and Digital Ethos lock horns in the studio and unleash their left-leaning Mars EP just in time for those midsummer psychonaut sessions under the stars. As always, the crew comes correct with wonky interstellar beats designed to blur the lines between weird and wonderful as celestial atmospheres and supernova beats and basslines battle for supremacy of that meat-bound body you call home. With both artists capable of dropping jaws and melting faces on their own, the resulting mind-melt that the pair offer up in collaboration mode makes for an ideal opportunity to strap Space Jesus and Digital Ethos down for a face-to-face conversation that is everything we’d hoped it would be. But before you dig in to the Q&A, be sure to lock your copy of the EP here. Space Jesus: If you could take an alternate form, what would it be? Digital Ethos: I would take the form of a light being residing in the upper atmosphere. Not only could I travel at light speeds, but I would exist in the liminal zone between our planet and space. What about you? Describe yourself as a combination of two animals. Space Jesus: I would have to say I am a cross between a dog and a bear. I am friendly and get along with almost everyone, but also don’t like to be bothered and would rather just eat and be alone. Forget animals, what inanimate object would you eliminate from existence? Digital Ethos: Chicago-style pizza. Now describe your music as food. Space Jesus: As difficult as this is, I would have to say a burrito. The answer is always yes, it’s heavy, and is filled with a bunch of ingredients that work well together. Let’s keep going with food; if humans moved to Mars, and you could only bring one food with you, what would it be? Digital Ethos: Hummus—it fulfills all human nutritional requirements. Related to interplanetary travel, if given the opportunity would you take part in the first wave civilization of Mars? Do you believe humans should terraform uninhabitable planets generally? Space Jesus: I think creating civilization on a new planet is promising. As long as the first wave of humans entering Mars came in peace, I would gladly take part. If you could curate your own event on a different planet, what would you name it? Digital Ethos: “Journey to the Forbidden Planet.” What about aliens—benevolent beings or aggressive adversaries? Space Jesus: Although the typical story of aliens is us at war, I don’t believe that to be completely true. I would say both. I can see them being keen to the idea of a joint force, but can also see them wanting to decimate us. Humans are not the most likeable species. What message would you give listeners before hearing our Mars EP? 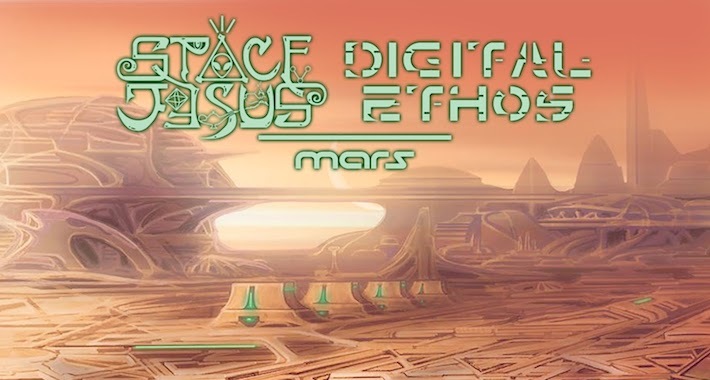 Digital Ethos: TheMars EP is an exploration of emergency communication in deep space. Imagine that you are receiving these unusual signals while scanning the cosmos for signs of life. Name one constellation; what does it mean to you? Space Jesus: If I were to name one, it would be Orion. It doesn’t mean much to me, but in high school I was always digging up underground hip-hop and came across a guy named Angry Mic (who is actually from New Jersey) and he had a line in one of his tracks: “Pants saggin’ down, I could borrow a belt from Orion.” That is the first thing that came to mind when you asked me this question.